A little over two weeks ago, I wrote about the sale of the ClintonKaine.com domain name for $15,000 via Flippa. At the time of the article, I mentioned that before the domain name’s registration information went private, it had been registered to an entity called Parscale Media. An article in the San Antonio Business Journal appears to connect this registrant with Donald Trump’s Presidential campaign. Because the domain registration is private right now, it is not entirely clear who owns this domain name. However, it does look like the domain name is being used to help Hillary Clinton’s competitor, Donald Trump. The Clinton / Kaine Presidential campaign could have bought this domain name when it was for sale. Now that it is being used against her campaign, it looks like it was a missed opportunity. I wonder if Mr. Trump is going to mention this at some point before the election to call attention to the fact that Mrs. Clinton did not get this domain name. Thanks to Bruce Breger for sharing this update with me. Would she have grounds for a UDRP action, if it wasn’t already too late? I’m not an attorney, but I doubt she would be able to win this. I also don’t think a proceeding would conclude in time for this election. A measly 15 grand would have avoided this. It still amazes me that people don’t understand the power of a domain name! I’m going to disagree with you in this particular instance, Todd. This time, I would dispute the “power of the domain name”. Keep in mind, there are barely 60 days until the presidential election ends. How much natural type-in traffic will ClintonKaine.com get in that 2-month interval? Without any extra promotion, I mean. Nowhere near $15,000 worth! The Trump campaign could have purchased clicks through a Google PPC campaign; and $15,000 would have resulted in far more actual traffic to the web page in question. Many other domains could have functioned as redirects to this anti-Clinton web page. They would have done the job equally well for $10. Something like DisqualifyClinton.com or DisqualifyHillary.com would be better, since they match the call-to-action headline on the web page. Plenty of memorable imperatives can be cooked up as slogans / redirects: e.g. StopHillary, BlockClinton, CancelClinton, NoHillary, IllegalHillary, etc. Hundreds of them to choose from. They’d all work as redirects and allow a $15,000 budget to buy clicks. That’s definitely better. Elsewhere, I’ve already pointed out that “Kaine” is difficult to spell. So ClintonKaine.com will actually leak type-in traffic rather badly. I see little inherent power in this domain. Nobody believes it’s an official representation of the Clinton-Kaine ticket; and that’s literally the ONLY thing the domain name has going for it. Domain names do have power. Especially if they’re thought of as brands to be invested in long term. This case is a bad example of how domains are genuinely useful … IMHO. I don’t agree. Those visiting this site are not voters who are already sold but voters that are possibly on the fence and want to learn more about Clinton. When the first thing they see is that horrible picture of her they automatically think of all the talk about her bad health. The added “disqualify Hillary Clinton” talk just adds fuel to the fire. To a simple voter it makes the Clinton ticket look amateurish that they didn’t have the wherewithal to secure the domain. Who cares about spending $15,000 on adwords. $15,000 to control your brand is a drop in the multi-million dollar advertising budget of their campaign. A fraction of visitors will be on the fence about whom to vote for. But only a fraction. Surveys estimate 25% of American voters are undecided. That means 75% of traffic simply won’t convert. Really, I doubt the web page in question would persuade undecided voters anyway. That kind of propaganda insults people’s intelligence – a dark, grizzled, photoshopped image of Hillary Clinton? That will appeal to Trump supporters, but it’s a turnoff for anybody else. What person, seeing that kind of over-the-top scaremongering, would hand over their email address to some Donald Trump newsletter? Trump supporters would, no doubt. But they’re redundant. Type-in traffic … negligible. Undecided voters … 25% of negligible. Undecided voters susceptible to scary pictures and willing to sign up for emails … a very small fraction of 25% of negligible. Nah. Most people don’t care about domains. Some domainers might judge this harshly, but that “simple voter” is paying far more attention to TV, radio, and social media than domain-based branding for this election. Keep in mind that BOTH the Republicans and the Democrats have been negligent in securing their own domains. This campaign has dragged on for several eternities by now; and with barely 2 months to go, neither ticket has bothered to pay attention to domains. If this domain is worth $15,000 with 2 months left, then it should have been worth $30,000 back in July when there were 4 months left. We’re looking at a domain whose potential value is shrinking daily and whose actual value today is nothing more than a trickle of redirected traffic – traffic, moreover, with a pitifully low conversion rate. 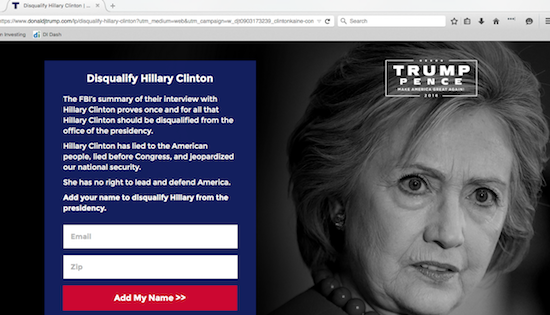 “DisqualifyClinton.com or DisqualifyHillary.com would be better, since they match the call-to-action headline on the web page. StopHillary, BlockClinton, CancelClinton, NoHillary, IllegalHillary, etc”. I believe ClintonKaine.com the better solution to attract/shock hillary supporters to convert, instill doubt, FBI, lie, lie, disqualify. Can’t miss these words even if you don’t read the short cta. All of the suggestions above only attract non-supporters. I don’t think that’s the point to this site. What is the benefit here? How much natural type-in traffic do we really think ClintonKaine.com is going to get? Fairly negligible, I imagine. And there’s no ability to CHOOSE who visits ClintonKaine.com. The redirect is wasted on anybody whose mind is already made up pro-Clinton or anti-Clinton. Only a small fraction of undecided voters can be influenced. So only a small percentage of type-ins to ClintonKaine.com will result in any benefit. If they had spent $15,000 on PPC advertising, then they could have purchased far MORE traffic during the next 60 days. Not only more, but also more useful traffic. They could have targeted their ad placements to attract more undecided voters. Paying $15,000 for a domain with virtually no type-in traffic and only 60 days of usefulness is a clumsy, inefficient way to advertise. Relax. it’s a little late in the game for a market evaluation strategy. Again, if you know you’ve already won, no need to protect every nook and cranny. Writing is a game of frisbee. Unimaginable that tossing words into the open air would seem anything but relaxing. This URL will get little type-in traffic. & you’re right. Most people don’t care about the candidates not getting these domains. In fact, if anything, it could have a negative effect – supporters of Clinton & Kaine getting angry and more determined to vote for them. Wow, the comments on here really show your ignorance. Do you really think someone would type in the domain if Trump got ahold of it… seriously. Trump is a genius, seriously you may not like him, but he beat Hillary on technology and on the internet where this election counts. LOL, and huh? I think you mistyped your thought because based on the legal notice in the footer, Trump (or someone affiliated) DID get ahold of that domain name. Both candidates have massive amounts of followers, so they could literally post anything and it would get thousands of views immediately. 6,000 views. Probably 5000+ bounce without even clicking on a link. Of the few who read, only a TINY fraction will be undecided voters. And only a fraction of that fraction of a fraction will be persuaded by those links to vote Trump. Trump has been paying Ted Cruz to rent Cruz’s email list. They can reach 280,000 Cruz donors for roughly the same price ($22k) as they paid for ClintonKaine.com. Donors are worth more than ordinary voters … in every sense. Donors buy a lot of marketing. Alternatively, the Trump campaign can send an email blast to Cruz’s 1.28 million supporters. Sorry, those 6000 page views lead to very little. “Trump is a genius”. Yes, truly an intellectual giant. That must be why the college-educated tend to vote against him. They’re afraid of his mental prowess.